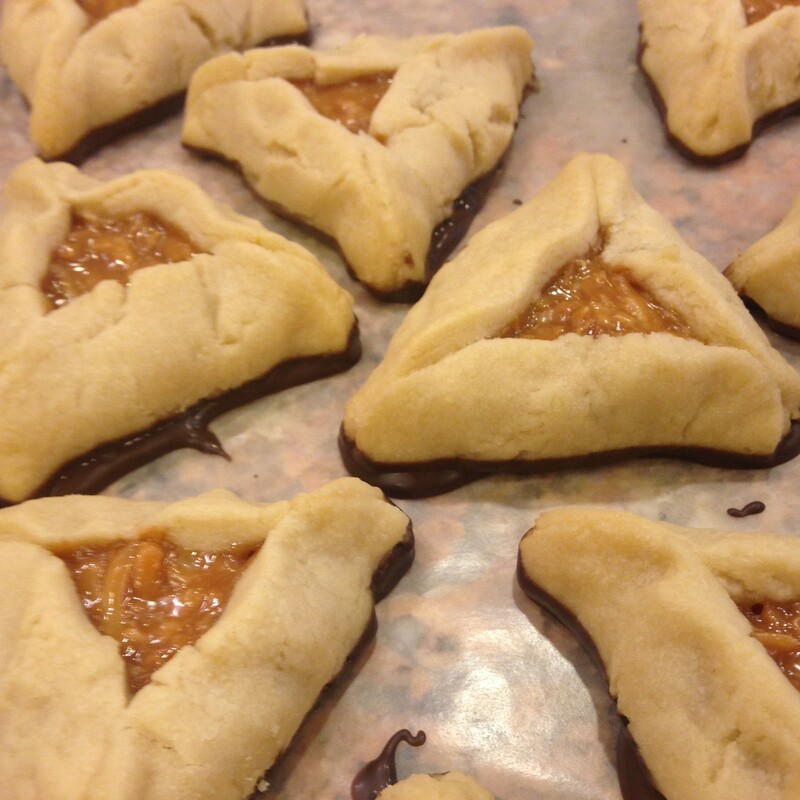 To bring it full circle, today Jews celebrate the story of Purim by eating triangle shaped cookies called hamantaschen, created to resemble the three-cornered hat that Haman supposedly wore (my hat, it has three corners…). Traditional hamantaschen consist of a very plain tasting dough filled with fruit preserves or poppy seed filling. What I have for you today is a modern and fun take on hamantaschen, although you can really never go wrong with traditional ones. 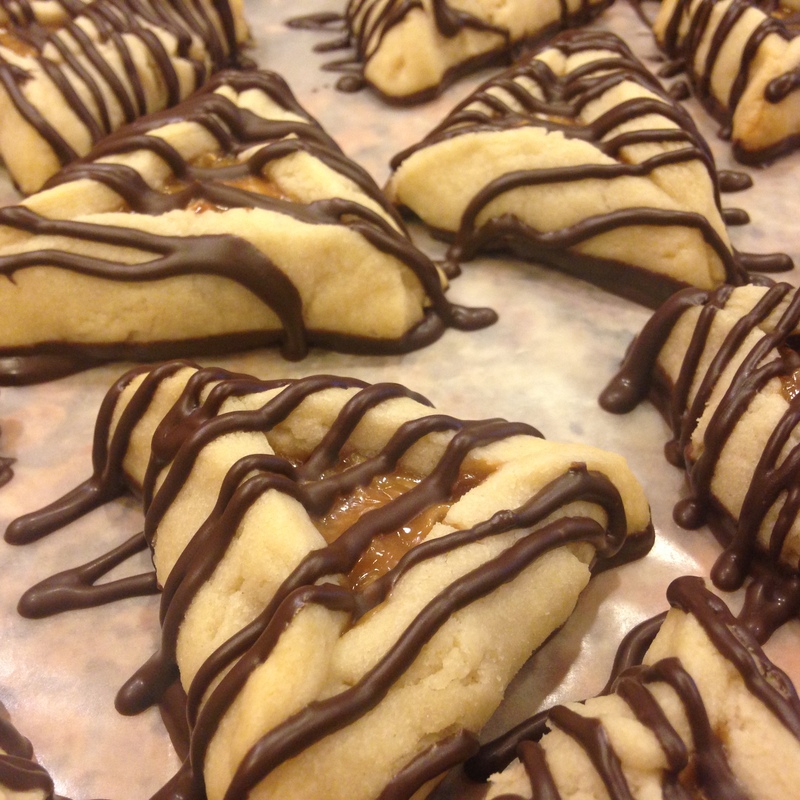 These hamantaschen are inspired by the second most popular Girl Scout cookie, Samoas. 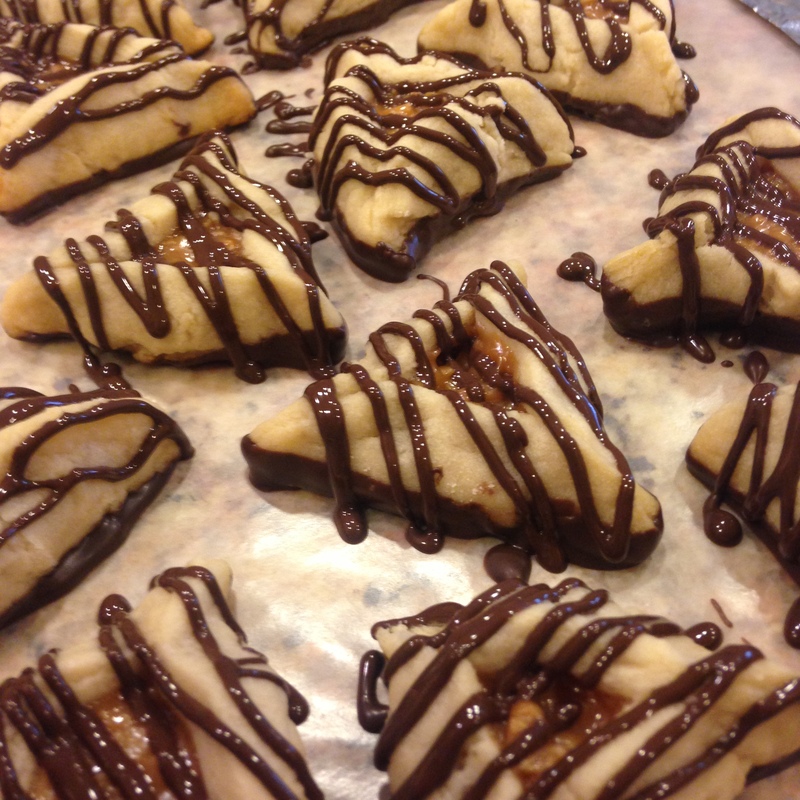 Like Samoas, these Samoa Hamantaschen involve sticky sweet caramel mixed with toasted coconut and dipped and drizzled in chocolate. If you do, make sure you have an entire day free and at least one or two people to help you. Only make them for people you really, really like, or people who are paying you a lot of money. To make the dough, beat together margarine or Butter Flavor Crisco (notes on that in the recipe below) and sugar. Then beat in heavy or whipping cream and vanilla extract. Once everything is completely combined, add in the flour one cup at a time with the beaters on low-medium. The cookie dough will look crumbly like it does in the photo above. Then, use your hands to squeeze the cookie dough together and wrap it in plastic wrap to store in the freezer for 10-15 minutes. While the dough is in the freezer, make the filling. 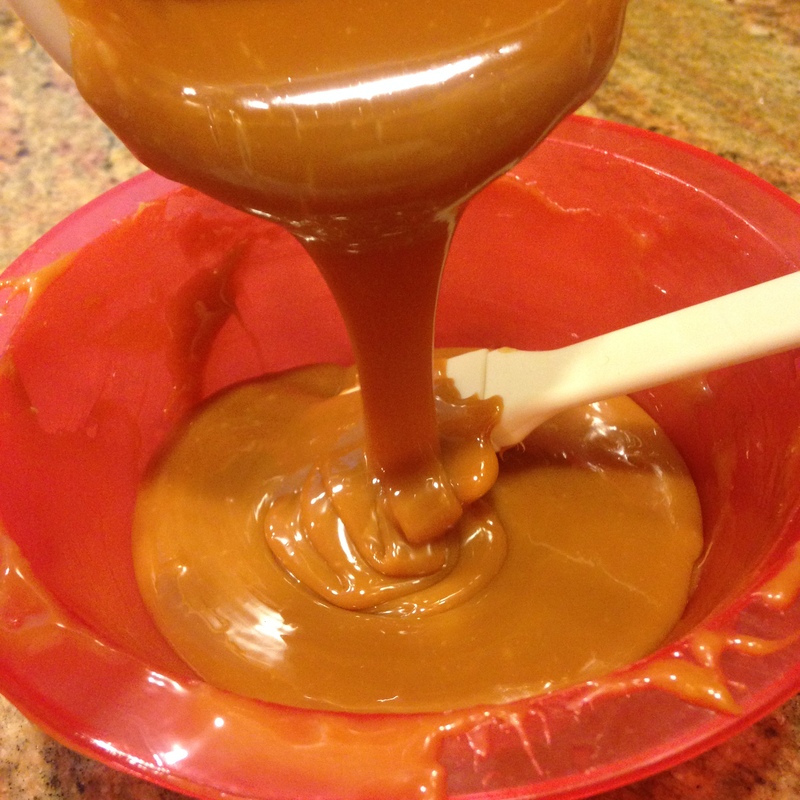 Start by microwaving caramel and a little bit of water in 30-second increments until you have smooth melted caramel. 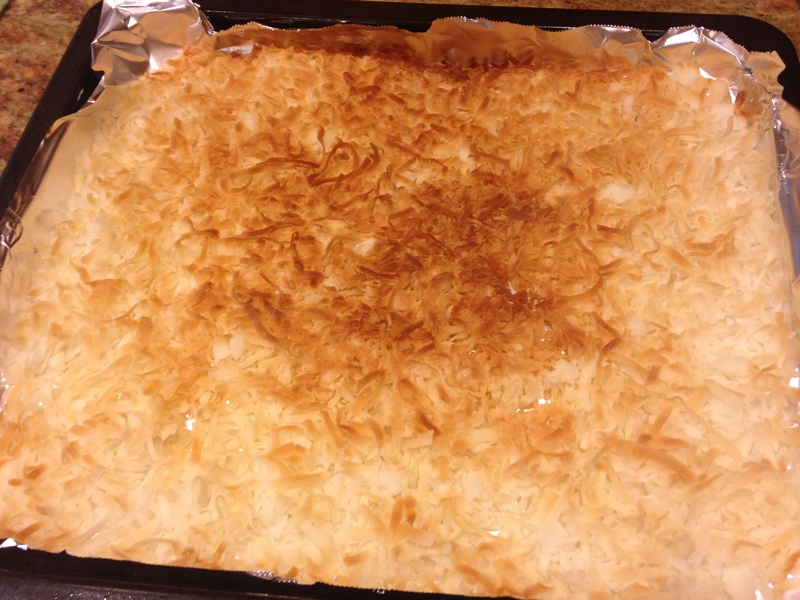 Then, spread the shredded coconut on a tray and bake in an oven or toaster oven on 350 for 5-10 minutes. Mix the coconut around every 2 minutes or so to ensure even toasting (which I clearly did not do, as evidenced below). You want the coconut to be lightly browned, but it goes from lightly browned to burnt very quickly so keep an eye on it. Then combine the caramel and toasted coconut, and your filling is complete. It will harden as it cools, but I actually found it a little easier to work with once it had hardened because it didn’t stick to the spoon/my fingers as much. To assemble the hamantaschen, remove the dough from the freezer and let it sit for a few minutes until it is easily roll-able. Lightly flour a clean, smooth, and dry surface and use a rolling pin to make an even layer of dough about 1/8-1/4 inch thick. 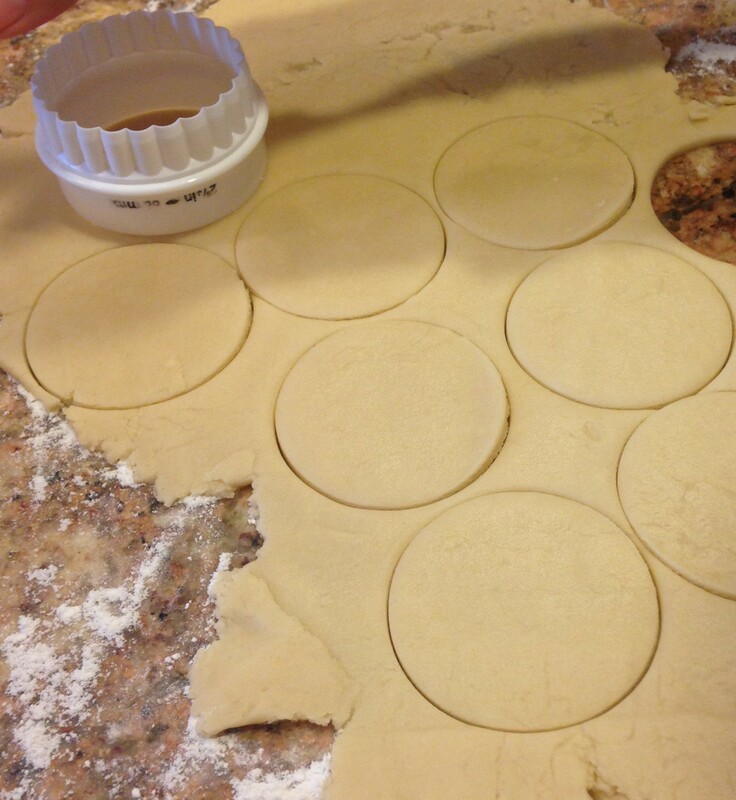 Then use a round cookie cutter (I recommend 2.5-3 inches) to cut rounds of dough. Transfer the rounds to a parchment paper lined cookie sheet and drop about 1/2 tablespoon of filling in the center of each round. Then, lift three sides of each circle and pinch together to create triangle shapes, leaving a medium-sized hole in the center so the filling shows through. Bake for 12-15 minutes on 375 until the cookies are golden brown. Allow to cool completely before removing from tray. While waiting for cookies to cool, melt two cups of chocolate by microwaving in 30-second increments and stirring in between, until melted and smooth. My favorite chocolate to use for melting and dipping is Merckens Candy Coating chocolate. Here is a link to the exact chocolate that I used for this recipe, though it is sold on many websites and you can probably also buy it in a local candy store. It melts really, really smoothly and dries very nicely too. I would recommend using either these or other chocolate specifically made for dipping, such as Wilton Candy Melts. If you use chocolate chips you’ll likely have a more difficult time getting the chocolate to melt smoothly, which will lead to frustrating dipping and less professional looking cookies. Once cookies are completely cool and chocolate is melted smoothly, dip the bottom of each cookie in chocolate. 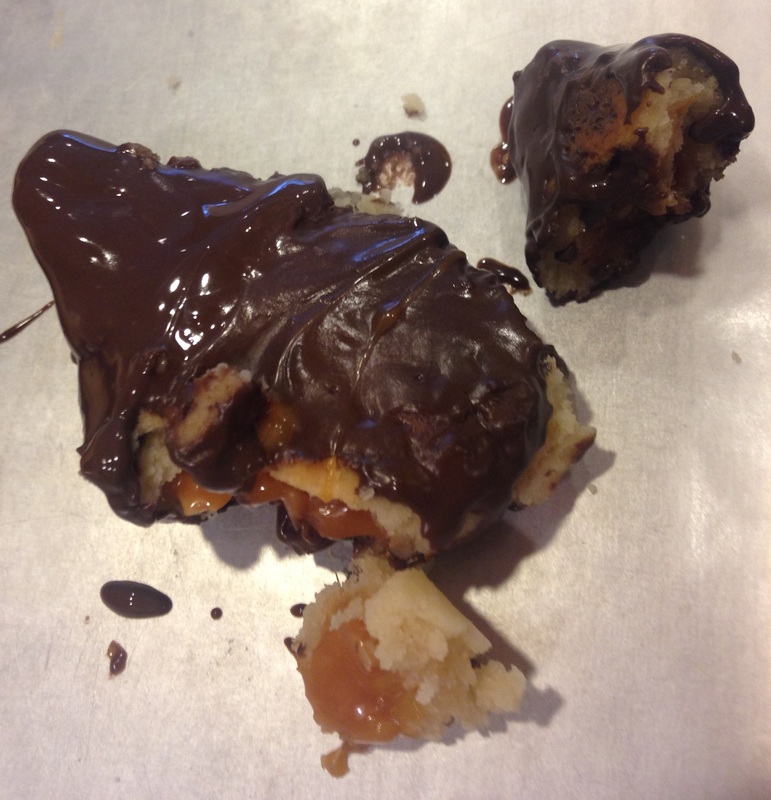 Place the cookies chocolate-side down on a sheet of wax paper and do not move until the chocolate is completely dry! Once all the cookies have been dipped, drizzle the remaining melted chocolate on top of the cookies. Feel free to drizzle any way you choose, but for a neater and more uniform look I recommend filling a zip loc bag with the melted chocolate and cutting a small hole in one corner to squeeze the chocolate out of. I used one of these fancy bottles for mine. Make 2 or 3 test hamantaschen before you make a whole sheet of them. Make sure you’re happy with the size of them and the amount of filling you use in each. If the hamantaschen come apart in the oven (the parts you pinched together don’t stick), try brushing the edges of the dough with egg whites before you pinch the sides together. The original recipe called for the edges to be brushed with egg whites so that’s what I was doing in the beginning, but then I got lazy and tried some without brushing with egg whites. Fortunately they held together just as well, so I didn’t use egg whites for the rest. Use a combination of a spoon and your fingers to drop the caramel-coconut filling on each round of cookie dough. It’s annoyingly sticky, which is why I mentioned it was easier to work with once it cooled and got less sticky. Don’t hesitate to stick the chocolate back in the microwave if it starts to harden while you’re still dipping and drizzling, but only for 15 seconds or so at a time. 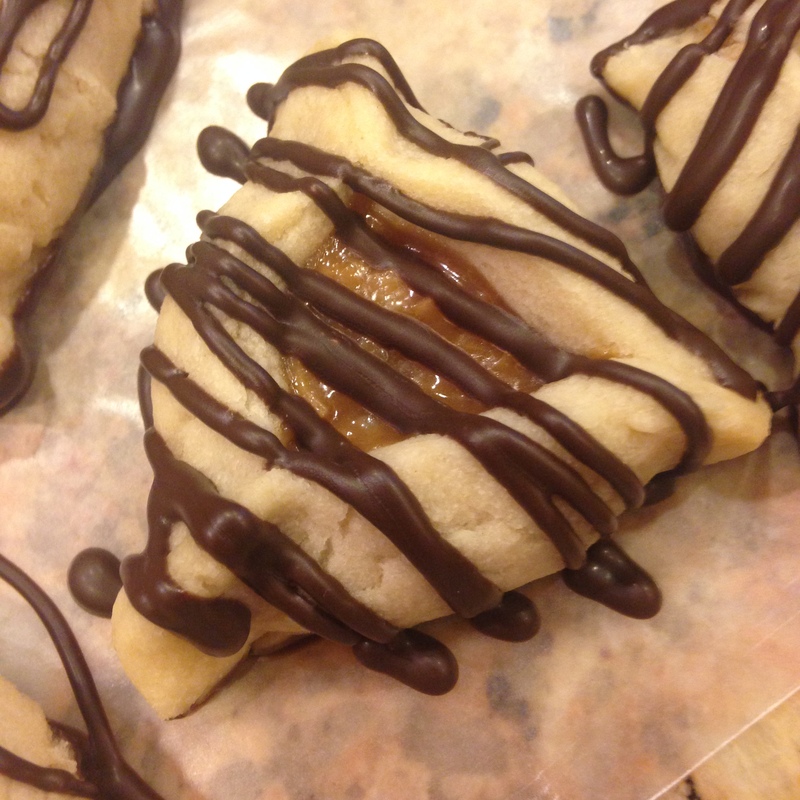 Make sure to take lots of pictures of your gorgeous Samoa Hamantaschen! 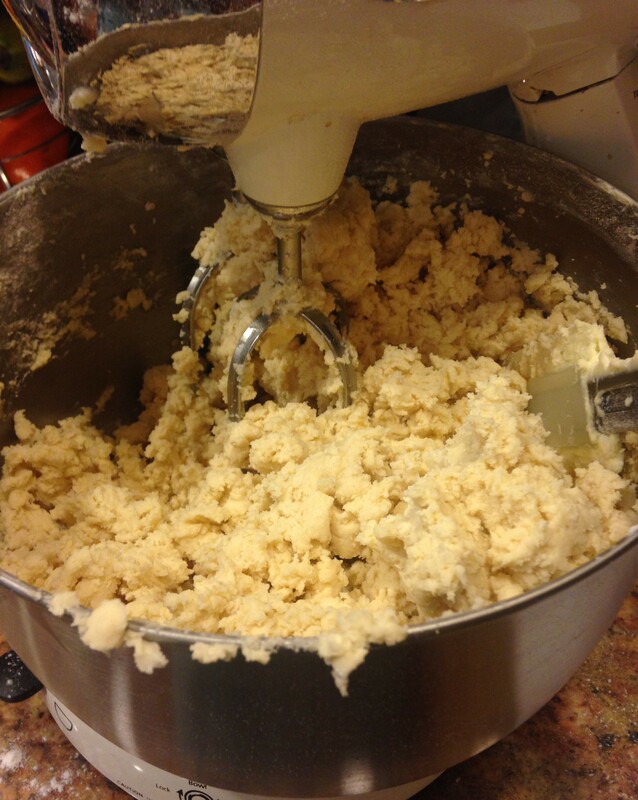 For the dough: Beat together the margarine (or Crisco + water) and sugar on medium-high until smooth and creamy. Then add in the heavy/whipping cream and vanilla extract, and beat on medium-high until fully incorporated (it should not be wet or shiny looking). With the mixer on low-medium, add one cup of flour at a time until completely combined. At this point the dough will be crumbly. Take the dough out of the bowl, use your hands to squeeze it together, and wrap it in plastic wrap. Place in the freezer. For the filling: Preheat oven or toaster oven to 350. Unwrap the caramels and put them in a microwave safe bowl with 3 tablespoons of water. Microwave for 30 seconds at a time, stirring in between, until caramel is smooth. Add additional water if caramel is too thick to easily pour. While allowing caramel to cool, spread out shredded coconut on a tray. Place in oven or toaster oven for 5-10 minutes, until coconut is lightly browned. For evenly toasted coconut, take out the tray and mix the coconut around every few minutes. Keep a careful watch because coconut will go from lightly browned to burnt very quickly. Mix together the coconut and melted (but slightly cooled) caramel. Make the hamantaschen: Remove the dough from the freezer and let it warm up on the counter for a few minutes so that it’s easier to roll. Preheat the oven to 375 and line cookie sheets with parchment paper. Lightly flour a clean, smooth surface (i.e. counter top) and roll out the dough with a rolling pin. 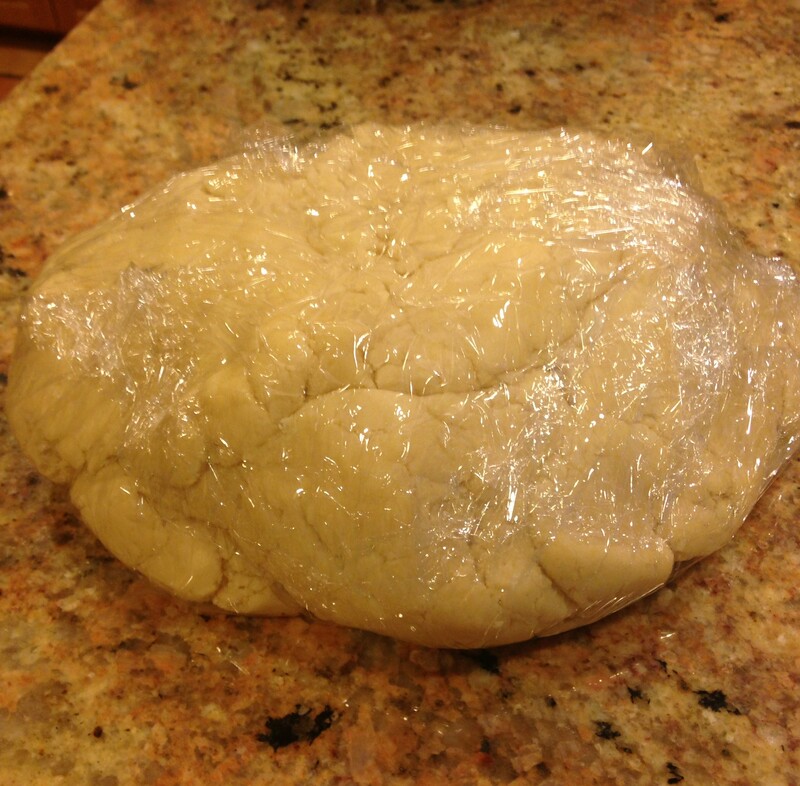 Try and roll the dough out evenly to about 1/8 – 1/4 inch thickness. Cut rounds of dough using a 2.5 or 3 inch cookie cutter, depending on what size you want your hamantaschen. 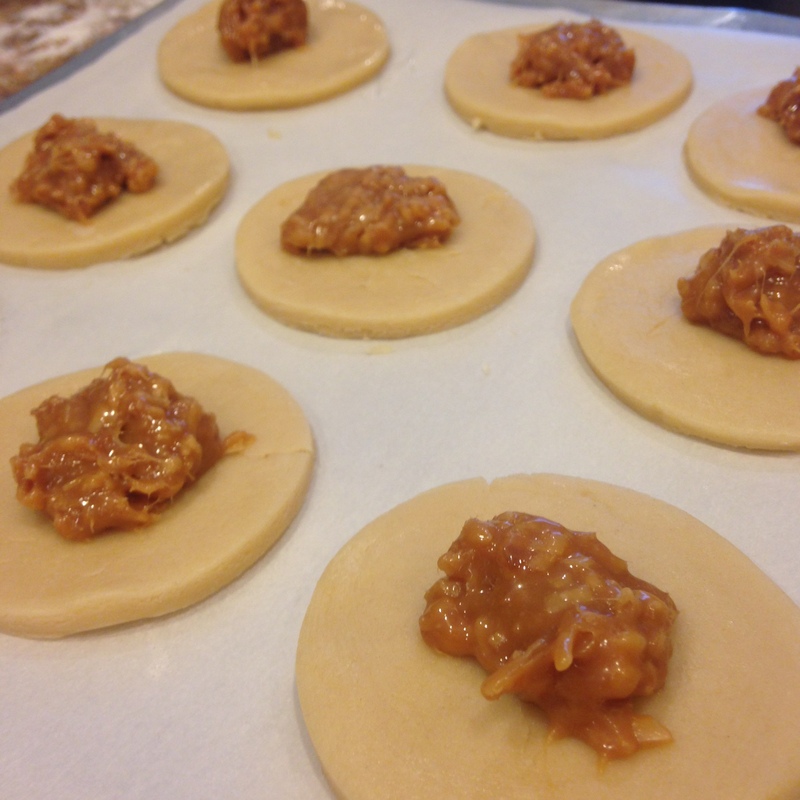 Move the rounds of dough to the lined cookie sheets and drop 1-2 teaspoons of filling in the center of each. 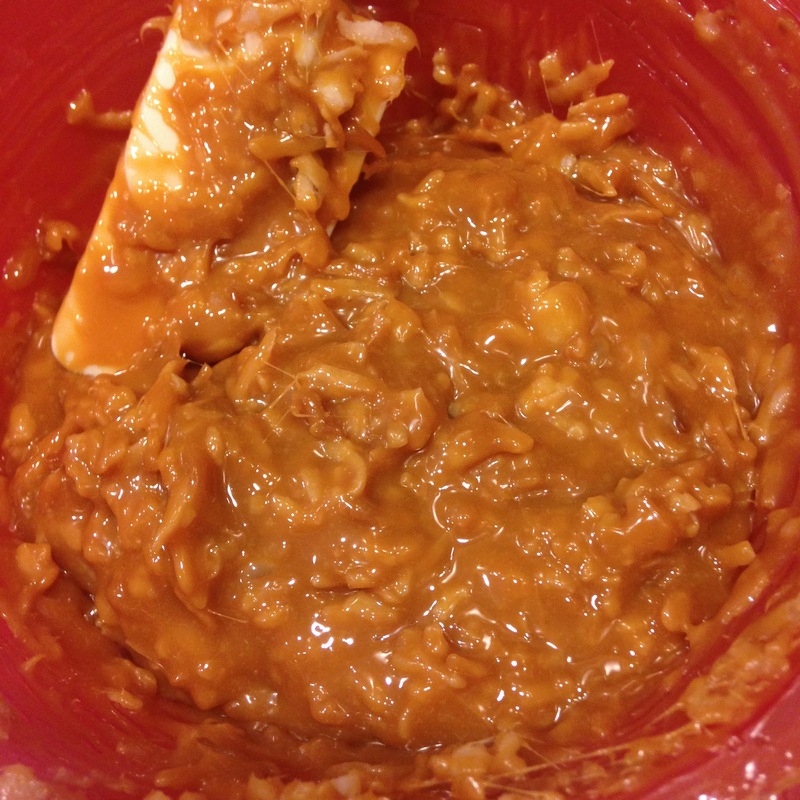 *** Caramel-coconut mixture will harden as you work, but I actually found it easier to work with when the caramel had hardened. Gently fold up and pinch together the edges of each to create a triangle, leaving a hole in the center. Bake for 12-15 minutes, until lightly golden brown. Leave on the tray until mostly or completely cooled. Dipping and drizzling the hamantaschen: Line the counter/table with wax paper. While the hamantaschen are cooling, put chocolate in a microwave safe bowl and microwave for 20-30 seconds at a time, stirring between increments, until melted and smooth. Once hamantaschen are completely cooled, dip the bottom of the hamantaschen in the melted chocolate, wipe off any excess, and place on wax paper right side up (chocolate side down). 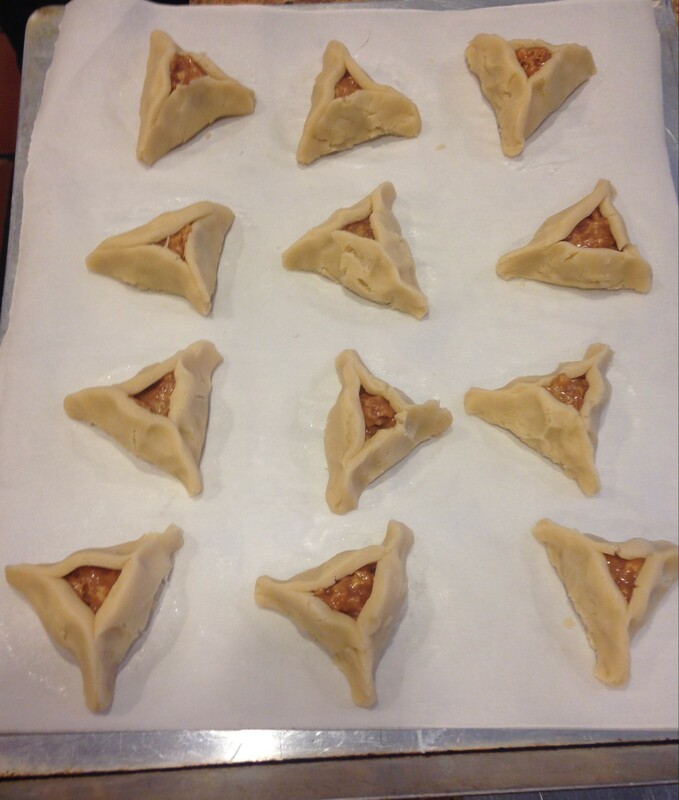 Once placed on wax paper, do not move the hamantaschen until the chocolate has dried completely! 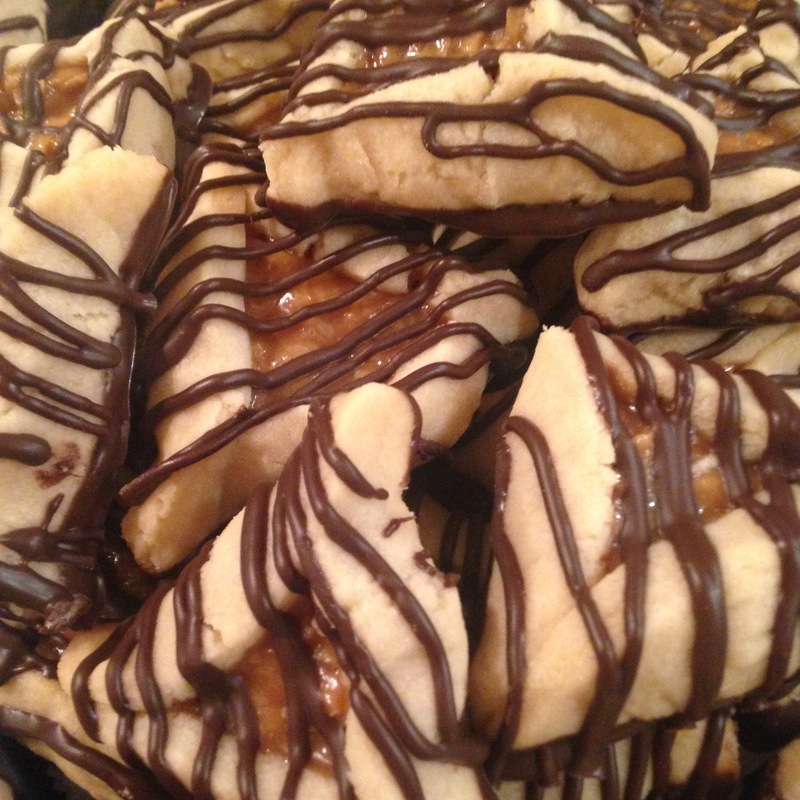 After all of the hamantaschen have been dipped, use the remaining chocolate to drizzle over the hamantaschen. You can use a spoon, a zip-loc bag with a small hole cut in one corner, or a special bottle for drizzling chocolate. Allow chocolate to dry completely and then enjoy! *If using Butter Flavor Crisco, make sure to add 2 tablespoons of water (as per directions on the Crisco container). Using Crisco is nice because it doesn’t need to be refrigerated so it is easier to incorporate with the sugar. **See notes on melting chocolate in my post above. I used dark chocolate but feel free to use whatever kind of chocolate you prefer or have on hand. ***If you find that your hamantaschen are coming apart in the oven, it helps to brush the edges of the dough with egg whites before you pinch the sides together. I used egg whites at first because the original recipe called for it, but I stopped using egg whites halfway through and had no problem with the cookies. Shout out to this downed hamantaschen, which I dropped into the bowl of chocolate and then destroyed in the process of trying to rescue it. With the amazing cookies aside, I’m SO obsessed with your music meets food theme.